These are good for a dessert platter or a special occasion because they're pretty and dainty. They would be lovely for a tea party or a small gathering. In the filling it says you can use milk, rum, or cognac, but if you're feeling wild you could use any flavor (although I'm not sure root beer would really work) :). The only pistachios in the recipe are just sprinkled on the top so if you wanted to use another nut you definitely could, maybe almonds? One of my friends came over and he tried these and said they were really good and my husband said he really liked them. Usually my husband will tell me if he's not a fan of something. There's enough baked goods to choose from around here usually and it's not going to hurt my feelings if he doesn't like it. 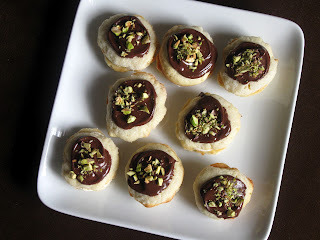 The thing to keep in mind with these cookies is that the cookie part is really bland but once you put them with the buttercream, chocolate, and nuts it makes the cookie. 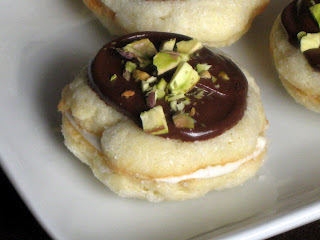 If the cookie was really flavorful it would take away from the cookie as a whole, and nobody would want that. 1. In a small bowl, combine flour and salt; set aside. In a medium mixing bowl, beat the 6 tablespoons butter and ¼ cup powdered sugar with an electric mixer on medium to high speed until combined. Beat in egg until combined. Beat in flour mixture on low speed just until combined. Cover and chill dough about 1 hour or until easy to handle. 2. Preheat oven to 350 degrees F. Shape dough into 3/4-inch balls. Place balls on an ungreased cookie sheet. Dip the bottom of a glass in granulated sugar and use to flatten each ball to a 1-1/2-inch circle. Bake about 8 minutes or until bottoms are lightly browned. Transfer cookies to a wire rack; cool. 3. Meanwhile, for filling, in a small mixing bowl, beat together ¼ cup powdered sugar, the 2 tablespoons butter, and rum on medium to high speed until combined. 4. To assemble cookies, spread filling on the flat sides of half of the cookies. Top with remaining cookies, flat sides down. Chill cookies about 30 minutes or until filling sets. 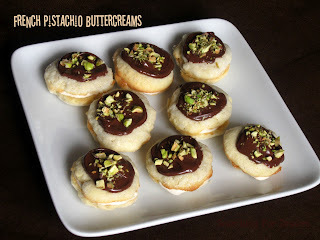 Drizzle or spread melted chocolate on tops of cookies and sprinkle with pistachio nuts. Chill about 10 minutes or until chocolate sets. Makes about 15 sandwich cookies.